This article will be the first in a series that attempts to help customers new to Adobe Connect find the data they are looking for in the format they need it. There are many built in report that are available to different group members (e.g. meeting hosts) in this article I will not differentiate between a meeting host and an administrator, just know that if you do not see the report that I am describing it is probably because you are not an administrator. Lets start with the basics, meeting reports. In Adobe Connect when you create a meeting room it is persistent, in other words it can be reused over and over again. A meeting host (build in group the provides the ability and access to an Adobe Connect Meeting) can access the following reports. In order to access this report simply login to Adobe Connect Central and find the meeting detail. The meeting detail can be found by selecting the “Meetings: menu at the top of the window. This is the area where your meetings will be available if you are in the “Meeting Hosts” group. These reports will return the reporting data that most customers want and use. For instance there is a summary report that shows the number of sessions held in the room as well as peak users per session. There is of course, attendance data per session. As well as a list of sessions that shows total attendees per session. Finally it is possible to return a list of questions from a given session. This may sound like strange wording, “By Questions” but this is not just polling data. You can of course create polls in any Adobe Connect live environment (i.e. Meeting, Virtual Classroom or Seminar room) but you can also delivery a quiz that was created in Adobe Presenter. If you deliver a quiz from Adobe Presenter in a Meeting each question in the quiz is treated as if it were a poll. In other words if there are ten questions in the quiz each question would be shown separately in this report. This is not the case if the quiz is converted to a Course and served in a an Adobe Connect Virtual Classroom but I will get to that later. If you select the link labeled “view answer distribution…” you will see a report that shows the percentage of attendees that responded to each possible answer. If on the other hand you select the link labeled “view user response…” you will see a list of users and their answer selection. You can download this data to a csv file. The problem is that if you had a survey that consisted of a number of questions you would have to download each question separately. I realized this was a problem some time ago and wrote a utility that would allow meeting hosts to download any number of questions that were presented in any of their meeting rooms. You can register to download that utility here. I put together a short video overview of that tool that can be accessed here. There are other areas in the Adobe Connect web application (Connect Central) to get data about meetings. 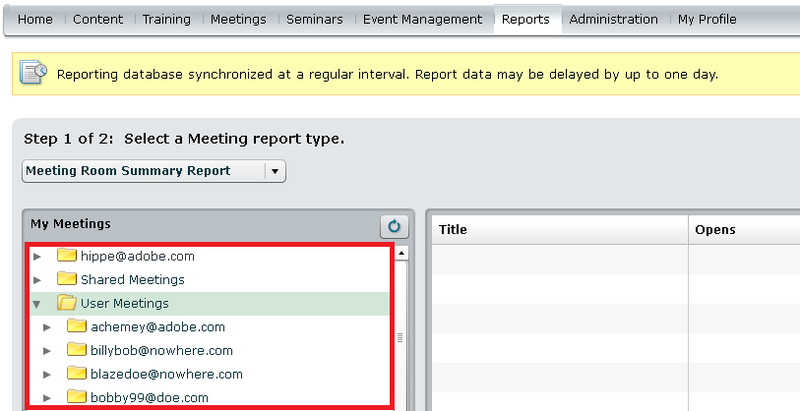 For instance you can run meeting reports from the reports tab of Connect Central. Once you select the “Meetings” option you will have options based on your permissions in Adobe Connect. For instance, if you are a meeting host you will have the ability to run reports on your meetings but if you are an administrator you will have the ability to run reports on all meeting hosts meetings. 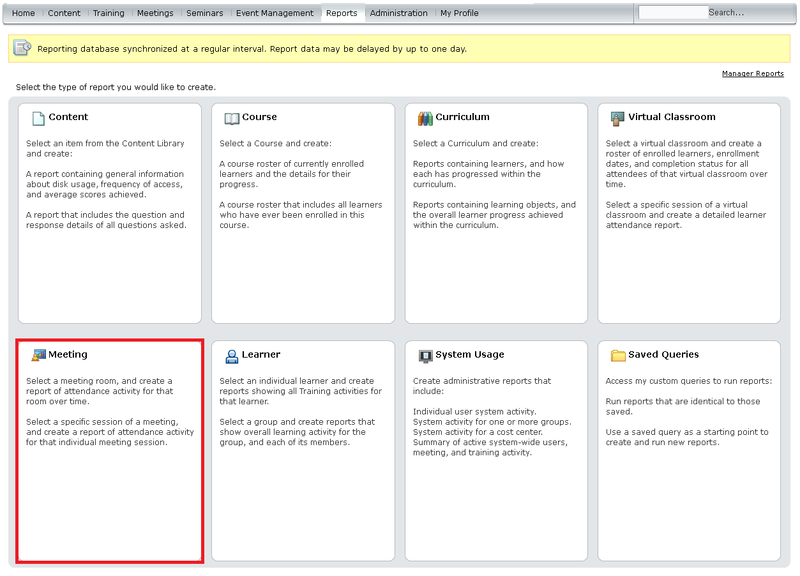 There are a couple of different types of reports for meetings that are available under the reports tab in Adobe Connect Central. There is a “Meeting Room Summary Report” and an “Individual Meeting Session Report”. Each allows you to set filters for the fields that you would like to see in the report as well as the date range. The date range is interesting because most of the other virtual meeting and training products on the market have no concept or a very limited concept of persistence. Adobe Connect is persistent by design, in other words the meetings can be reused over and over again and that is the reason for the date range filter. The summary report is just that a summary of all of the sessions that have been held in the selected meeting room. Whereas the session report provides information about a specific session held in the selected room. That is all for the first article in the series. In the next article I will cover bulk downloadable reports and how to use them to get specific information.